Radial Engineering has appointed Stage Audio Works as its distributor for the African region. 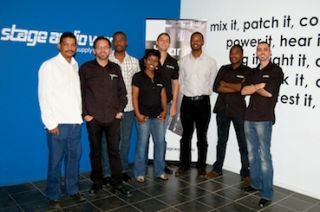 The Stage Audio Works Team (L-R): Heinrich Burrows, Will Deysel, Arnold Serumula, Nomsa Kheswa, Gustav Barnard, Xolani Madwe, Rudolph Maswanganyi, Shaun Xavier. Stage Audio Works, based in Southern Africa, is supplier of cutting-edge live event audio and lighting technologies. Radial's international sales manager Steve McKay: "Their philosophy of providing the highest quality products in their distribution lines up perfectly with Radial Engineering's product brands; Radial Pro Audio, Tonebone guitar pedals and Primacoustic acoustic products. Having well developed service, training and technical support departments further enhances the possibilities for the future."